Over the past few weeks this guy (I assume?) has fast become our second favourite sheep in the Falklands. Just outside Goose Green settlement, he has abandoned his friends and found some lovely grass in an inexplicably fenced-off area. We are reliably informed by our friend involved in the de-mining program that it takes 30-35kg to set off the anti-personnel mines and they are very much still active. Milo weighs in at over 40kg, so the jury’s out on this guy’s chances (especially with previous form here of a cow setting of an anti-tank mine with disastrous consequences). Is his weight spread over 4 legs enough to see him through? How long will he last? Will he escape? Can they allow him to stay in there? Gripping drama at 51 degrees South! The Brits love a plucky underdog: God speed, unknown sheep of the Goose Green minefield! It’s the Easter holidays here, with an extra bank holiday thrown into the works for the Queen’s Birthday (interesting to note that it is celebrated here with a bank holiday, a parade, a 21 gun salute, an RAF fly-past and the Governor receiving the Royal salute whereas I recall no town near me in the UK adopting such formalities; a taste of how British the inhabitants of the Islands feel). With that in mind, we decided to get out to Camp for the weekend with a trip to the settlement of San Carlos to stay in some self-catering at Kinsford Valley Farm. While we were up that end of the East Island (see the Falklands map on the link at the top) we took the opportunity to visit one other place I’d been wanting to visit since we arrived here. In 1950, for reasons that we struggled to fathom, it was decided that a mutton processing and meat tinning factory should be established on the far side of San Carlos water. Of all of the places in the World that I would choose to establish a business like this, I can’t say I’d have chosen this particular spot given its lack of access, labour market, communication and, well, anything. Unbelievably, the factory didn’t succeed in its commercial hopes and shut shortly after. Although these buildings could never have predicted it, this wasn’t to be the end of their working life. 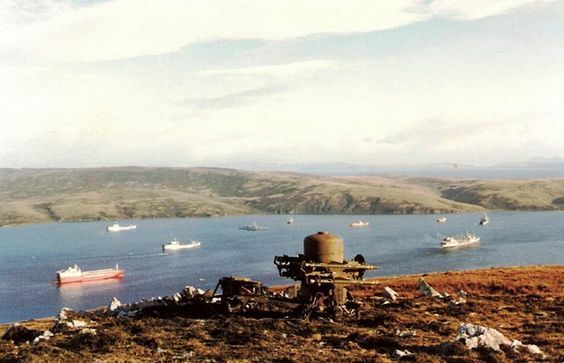 Ajax Bay provided the British forces landing in 1982 with a useful site for a field hospital. True to military form, it was soon given a name-change and became known to most as ‘the Red and Green Life Machine‘ (in reference to its impressive record: all those who entered alive, left alive). The old foundations of a temporary platform, perhaps? Given my background in the Falklands conflict and the fact we now live here, I’m not sure I will ever find it anything but humbling and deeply fascinating to see the remnants of the 74 days of land, sea and air battles that litter these islands. I guess if you live on an island not too far off the coast of a friendly country, transport and connections aren’t too much to worry about. 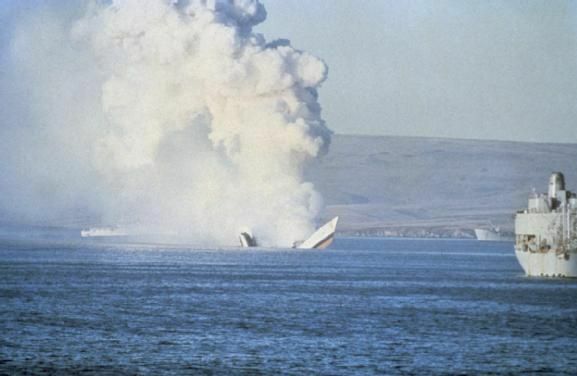 In, say, the Channel Islands, if something goes wrong with one form of transport, it won’t be too long before another boat, plane or helicopter is able to zip out and provide whatever connection is needed. Remote island nation in the Atlantic aren’t so lucky. Our ‘Airbridge’ RAF plane link is the main way in which we in the Falklands get to and from the UK. It stops at the bizarre island air base of Ascension Island, which this week it was announced has been closed due to problems with the runway. Wideawake Airport, Ascension Island – not as good as it looks, apparently. While that severed our main link to the UK for the weekend, our Airbridge has been rerouted via Senegal which is a bit irritating but of no major consequence to us here (we hope). You do have to feel for the people of St Helena, whom the Falklands shares a great deal with as a fellow remote Atlantic British overseas territory. Following the farce over their £250,000,000 airport that isn’t fit for purpose, their main link to the outside world was by the aging boat RMS St Helena, but that has now broken down too as a result of being overdue her retirement. Combine that with the significant sailing time even once a boat has been organised and things may be getting difficult for them as well as those stuck on Ascension Island itself. We hear that the engineer who certified the airstrip unfit for purpose is among those trapped there – I wonder if he/she is regretting their decision to report their verdict BEFORE returning home. Sometimes things happen that serve to remind us here in the Falklands of our remoteness as a small island nation, but perhaps we should be thinking about it the other way; we have a functioning airport and a regular flight to the UK (expensive as it is), so really things could be a lot worse. (Apologies for the lack of focus in some of the photos, I was carrying the wrong lens).